THE PEOPLE’S REPUBLIC OF CHINA (PRC) is pursuing a long-term, comprehensive military modernization program designed to improve the capacity of China’s armed forces to fight and win “local wars under conditions of informatization,” or high-intensity, information-centric regional military operations of short duration. China’s leaders view modernization of the Chinese People’s Liberation Army (PLA) as an essential component of their strategy to take advantage of what they perceive to be a “window of strategic opportunity” to advance China’s national development during the first two decades of the 21st century. During this period, China’s leaders are placing a priority on fostering a positive external environment to provide the PRC with the strategic space to focus on economic growth and development. At the same time, Chinese leaders seek to maintain peace and stability along their country’s periphery, expand their diplomatic influence to facilitate access to markets, capital, and resources, and avoid direct confrontation with the United States and other countries. "is strategy has led to an expansion of China’s presence in regions all over the world, creating new and expanding economic and diplomatic interests. 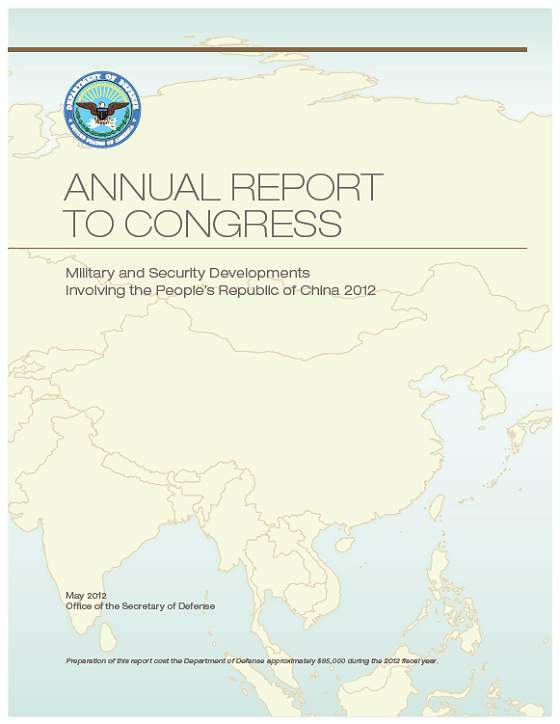 As these interests have grown, and as China has assumed new roles and responsibilities in the international community, China’s military modernization is, to an increasing extent, focusing on investments in military capabilities that would enable China’s armed forces to conduct a wide range of missions, including those farther from China. Even as the PLA is contending with this growing array of missions, preparing for contingencies in the Taiwan Strait remains the principal focus and driver of much of China’s military investment. In this context, over the past year, the PLA continued to build the capabilities and develop the doctrine it considers necessary to deter Taiwan from declaring independence; to deter, delay, and deny effective U.S. intervention in a potential cross-Strait conflict; and to defeat Taiwan forces in the event of hostilities. To support the PLA’s expanding set of roles and missions, China’s leaders in 2011 sustained investment in advanced cruise missiles, short and medium range conventional ballistic missiles, anti-ship ballistic missiles, counterpace weapons, and military cyberspace capabilities which appear designed to enable anti-access/ area-denial (A2/AD) missions, or what PLA strategists refer to as “counter intervention operations.” The PLA also continued to demonstrate improved capabilities in advanced fighter aircraft, as evidenced by the inaugural flight testing of the J-20 stealth fighter; limited power projection, with the launch of China’s first aircraft carrier for sea trials; integrated air defenses; undersea warfare; nuclear deterrence and strategic strike; improved command and control; and more sophisticated training and exercises across China’s air, naval, and land forces. Underscoring the extent to which China’s leaders are increasingly looking to the PLA to perform missions that go beyond China’s immediate territorial concerns, over the past year the PLA deployed assets to support non-combatant evacuation operations from Libya, extended its presence in the Gulf of Aden for a third year of counterpiracy operations, took on leadership roles in United Nations peace operations, and conducted medical exchanges and a service mission to Latin America and the Caribbean using the PLA Navy’s hospital ship. During their January 2011 summit, President Barack Obama and China’s President Hu Jintao committed to work together to build a cooperative partnership based on mutual respect and mutual bene!t. Within that framework, the U.S. Department of Defense seeks to build a military-to-military relationship with China that is healthy, stable, reliable, and continuous. Strengthening the U.S.-China military-to-military relationship is a part of shaping China’s choices by encouraging it to cooperate with the United States and its allies and partners in the delivery of international public goods, including in such endeavors as counterpiracy, international peacekeeping, and humanitarian assistance and disaster relief operations. As the United States builds a stronger foundation for a military-tomilitary relationship with China, it also will continue to monitor China’s evolving military strategy, doctrine, and force development. In concert with Allies and partners, the United States will continue adapting its forces, posture, and operational concepts to maintain a stable and secure Asia-Paci!c security environment.